Today’s recipe is filling two roles: first is Soup Saturday Swappers hosted by Paula at The Saucy Southerner, who chose the theme Chilled Soups. 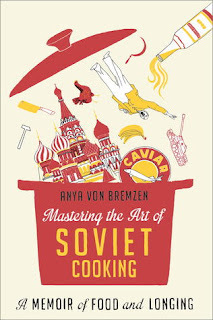 The second is this month’s Cook the Books Club hosted by Simona from Briciole who chose the book Mastering the Art of Soviet Cooking: A Memoir of Food and Longing by Anya von Bremzen. I have to tell you - I cringed immediately, anytime there's a title that long, I nearly always find the book loathsome and pretentious. In the book, the author strives to meld a history lesson, memoir, and food into a seamless, touching story. Instead, the book read like a dry textbook, followed by a memoir with too many people to keep track of. I nearly quit reading a quarter of the way through. I actually stopped about half way because I just did. not. care! 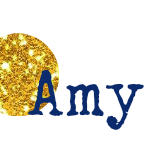 You can see my full review on GoodReads if you're interested. However, I did get my foodie inspiration in the form of Borscht, which is mentioned several times as a warm winter meal and once as a light, chilled summer meal. I recently made a delicious Roasted Root Vegetable Soup that featured beets, so I warmed quickly to the idea of borscht. Chilled soups though? Those are pretty far out of my comfort zone! So here’s what I did: I made my recipe for chilled borscht and served it hot for dinner (oh my gosh amazing! ), then I served the leftovers chilled the next day for lunch (meh). Yeah, the amazing soup was not quite as amazing served chilled. I nibbled the cucumber pieces out of my bowl, then stuck it in the microwave. Much better! The verdict? If you’re a chilled soup sort of person, you’ll probably dig this, it’s pretty amazing. If you aren’t sold on chilled soups, make this anyway, because it’s fantastic as a warm soup! Oh, and unless you’re a Soviet Union enthusiast, go ahead and skip the book. Heat the oil in a soup pot over medium heat. Add the onions and carrots and cook until slightly softened, about 3 minutes. Add the garlic and beets and cook for another minute. Season with salt and pepper and basil. Stir in the beef broth and simmer until the beets are tender, about 30 minutes. Use an immersion blender to lightly blend the soup (it should still be a little chunky). If desired, serve immediately with a dollop of sour cream. Otherwise, cool and refrigerate overnight. Once chilled, serve with a dollop of sour cream and diced cucumbers. Heat the oil in a soup pot over medium heat. Add the onions and carrots and cook until slightly softened, about 3 minutes. Add the garlic and beets and cook for another minute. Season with salt and pepper and basil. Stir in the beef broth and simmer until the beets are tender, about 30 minutes. Use an immersion blender to lightly blend the soup (it should still be a little chunky). If desired, serve immediately with a dollop of sour cream. Otherwise, cool and refrigerate overnight. Once chilled, serve with a dollop of sour cream and diced cucumbers. Yeah.....I wasn't a fan of the book either but I also made an amazing Borshch using her father's recipe from the book. It made buying the book worth the money just for that recipe. Love your honest review! The color on this soup is gorgeous! I'm with Karen, I appreciate your honest review. I'm not a big fan of red beets, but it's certainly a pretty colored soup. I may try the golden beets that Paula mentioned, and see what the flavor difference is. 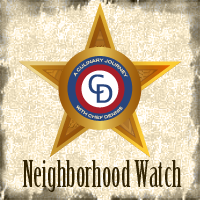 I quit a few chapters in, too, and decided to sit this one out - but I'll be peeking into the round up for sure! 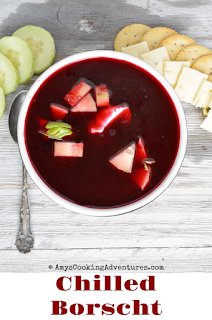 Your borscht recipe sounds delicious! I'm not a huge chilled soup fan so I like your idea of heated borscht. I hear you about the book. I tried to keep a very open mind. I did enjoy the last half MUCH more than the first. I think if my sister hadn't have told me she loved it, I would have put it up long ago. I just kept waiting to find the love...didn't happen. Not a fan of the book either, but it was passable. But this soup looks amazing! I've never been able to get past the dirt taste of beets. I'm 25% Polish and I'm probably an embarrassment to the ancestors but I just can't do it. 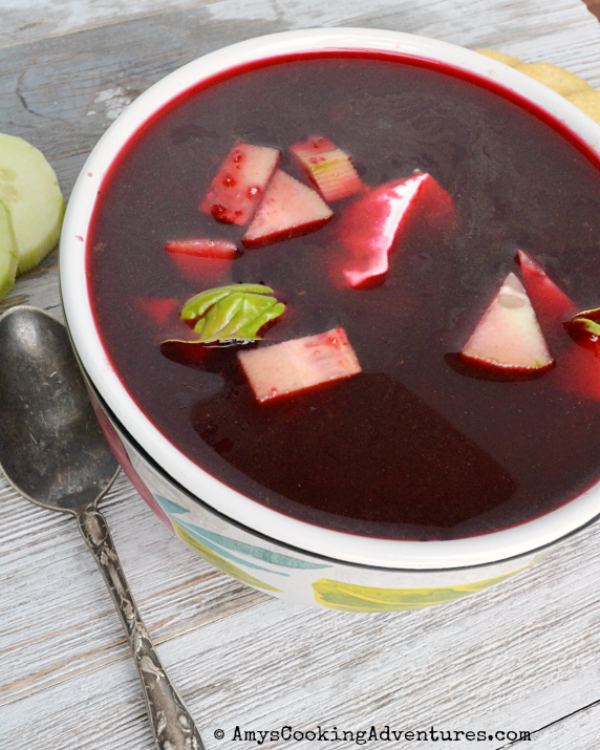 I've made both hot and cold borscht, and enjoy them both, but the chilled version especially in Summer. Not my favorite book either, though quite interesting in a historical sense. Well I loved the book...seems I am the only one lol. Totally great about your honest review. 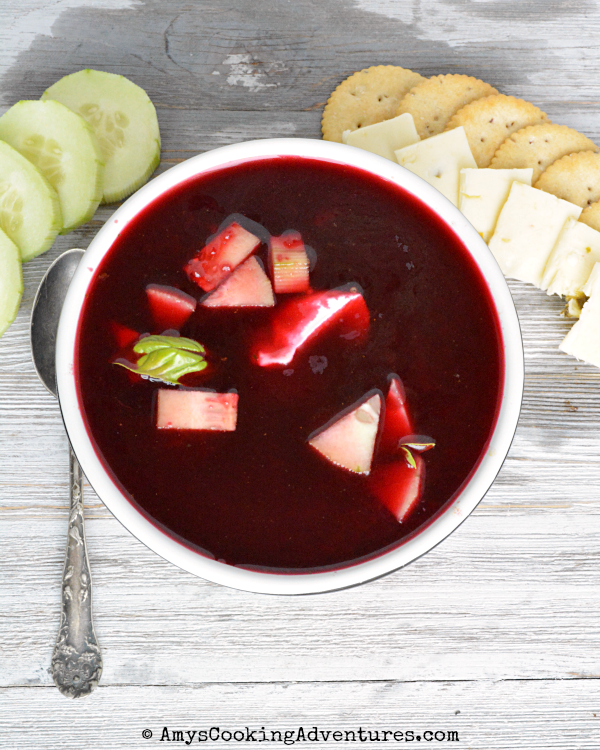 I liked cold soups in the summer...but a borscht? Would have to try it to see, hot it looks amazing.